Is the NFPA 701 label sewn on this tent? Actually, no. This tent carries only a CPAI-84 certification. Is the Caravan Canopy waterproof? 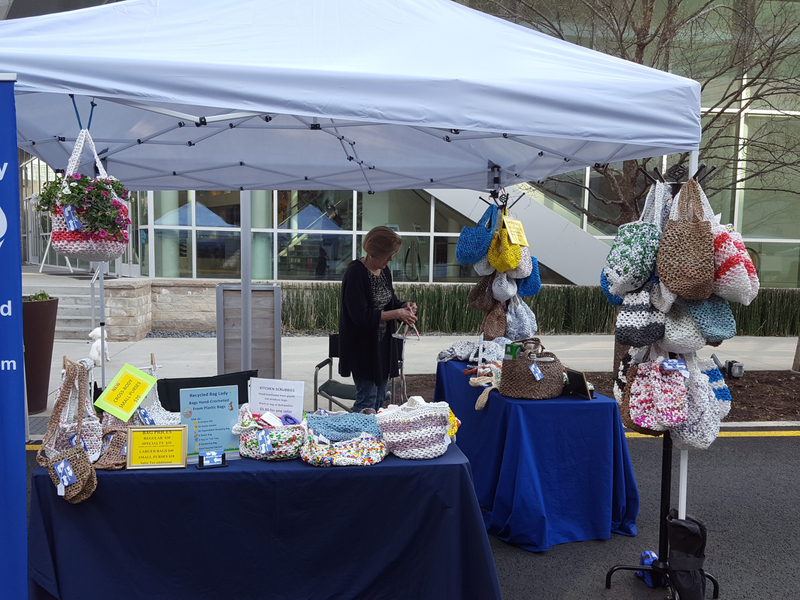 I'm interested in using this canopy for craft shows. Caravan canopies are water-resistant, not water-proof. The only waterproof canopies we offer are Vitabri, found here. I want to take this to the beach? How will this one hold up? This canopy, as with ALL pop up canopies are not permitted to be used in high wind or inclement weather situations due to the fact they may become damaged. Keep in mind that weather related damages are not covered under the manufacturer's warranty. What steps to follow to set up? What sort of system does this tent have to secure it to the ground? Is there a hole at the bottom of each foot for a spike, or is there some sort of attachment, so a weight can be added to keep the tent grounded? All of the Caravan Canopies come with a standard stake kit for you to secure your canopy in case of windy conditions. We also suggest weight bags if you are setting your canopy up in an area that can not staked. Can you purchase individual side walls for the tent? There are currently no sidewalls available for the M-Series. Can I get replacement covers for existing frames? Please contact the manufacturer, Caravan, directly, as we do not offer the replacement tops for this particular canopy. Do you have a 6' x 10' with a door (Door being on the 6 part)? 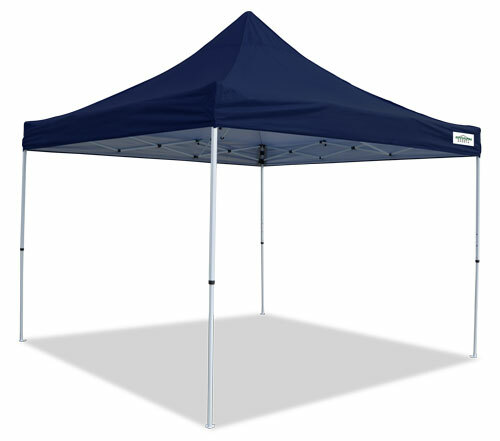 We currently do not offer any 6' x 10' pop up canopies. Are these tents certified flame retardant by the state of California and labeled as such? Can one person set up and take down this canopy by themselves or does it require two people? Thank you for your inquiry. The Caravan canopy can be set up with one person but we do recommend that you have two people just to help make the set up easier. Can 1 person put this up? Provided that you are able to brace one side of the canopy to provide resistance, you could then pull this frame from the other side to expand it. This would allow you to open this frame by yourself. Will this tent hold weight hanging from it like display peg boards? Caravan advises that the frames are not intended or manufactured to hold any extra weight. Is this flame resistant or does it have a rating? Are side panels available for this model? There are not sidewalls available at this time for the M-Series Caravan canopies. Is this Caravan Canopy M-Series Pro 2 instant 10x10 straight leg canopy with rising truss system flame resistant? Thank you for your inquiry. The M Series has a regular fire coating and does not have any specific fire rating tests it passes. Do you sell just the replacement canopy tops for a Caravan 10 x 10 canopy? If so, where do I find it listed? What is the height of this Caravan M-series canopy when it is folded down and without the bag ? I need to know if it will fit in my car. It is approximately 50" long when folded down. It's approximately 5'0 and VERY compact, my company has bought 4 of them for our field agents. In the carrier, this measures approximately 56". How long is the roller bag that this canopy packs into? The roller bag included with the Caravan Canopy M-Series Pro 2 Instant 10'x10 Straight Leg Canopy with Rising Truss System is 4' long and 9" diameter. It is 50 1/2 inches long and 10 inches wide. It is a really nice canopy. The tent, when in the case, is less than 8 feet long. I don't know the exact measurement because I don't use the case any more. But when I did use it, it fit into the bed of my truck which is a long bed, 8 feet deep. It is about 1-2 feet shorter than 8 feet. I know this is not exact but I hope it helps. Is this canopy easy to set up for a female that is 5' tall? Are the materials of the frames aluminum? Is this canopy light weight? How many people are required to set this canopy up? Does this canopy require special tools and a ladder to put up? The canopy weighs 30 pounds and can be set up by one person in most cases. Of course, every person is different. The canopy simply unfolds and requires no special tools. We would encourage you to view the assembly on the item page. Basically, you begin unfolding the frame, place the top on, finish unfolding the frame and then raise the frame up. Is this a canopy where the top stays attached to the frame or do you have to leave the top off to fold it up? As with most pop-up canopies, the manufacturer suggests you remove the top before folding up the frame. This is to both prevent possible tears in the canopy top as well as potential damage to the frame due to it not folding properly if the top in caught in the frame. What is the name of the fabric used on this product? What is a denier count? 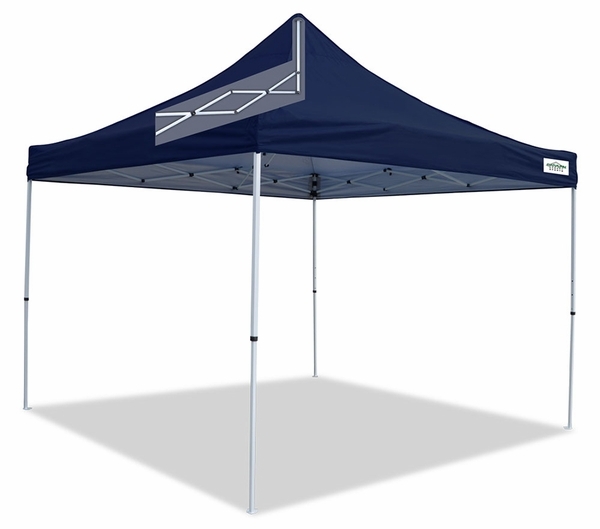 Caravan Canopy M-Series Pro 2 Instant 10'x10 Straight Leg Canopy comes with a 150 denier polyester top. The higher the denier the thicker the material. How much does the 10 X 10 Caravan Canopy Traveler weigh? The 10 x 10 Caravan Traveler weights 45 pounds. Can this be set up on hard surface? Also, is this canopy water resistant? Do you have vinyl canopy tents? I need a 10x10 that is vinyl, not fabric. In the pop-up style, the only vinyl topped canopies we have are the Vitabri canopies. These come not only in 10 x 10 but also 10 x 15 and 10 x 20. Are there sidewalls I can purchase that are made to work with this canopy? If so, could you please lead me to them? There are no side walls available for this canopy. Please see our Canopy Package Deals for canopies with walls. Is this model fire resistant? No, it is not. Please see the list of fire resistant rated canopies that we do carry. Is the canopy designed to effectively shed water? I have read some reviews that indicate that the canopy collects water and may collapse if you get caught in a cloud burst. 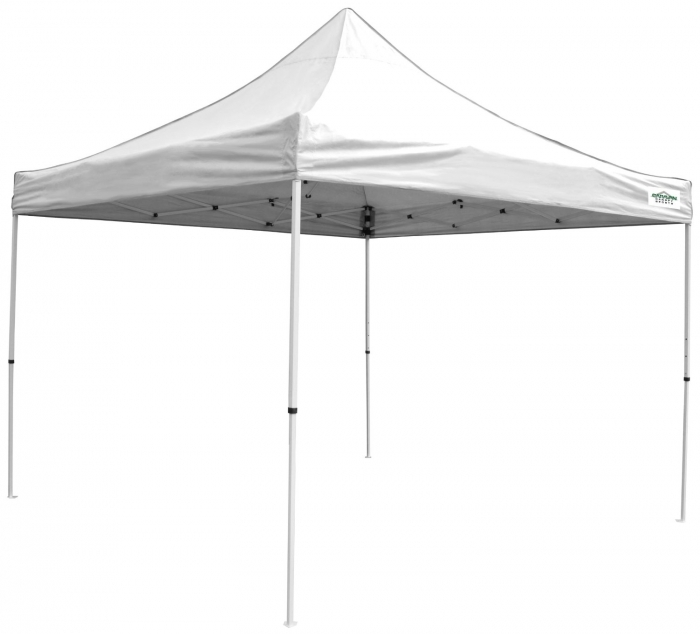 This product is designed with the intention to be used only as a shade canopy. Some customers report that the product will hold up under a moderate rain, but I cannot guarantee that it will. Pooling of water is indeed an issue on pop up type canopies and it can collapse the frame if the water is not pushed off regularly. It did not rain on me until the ninth time I used the canopy. There were several outbursts that day, some of them quite heavy. Most of the rain came right down the 4 sides of the canopy, but a small amount collected near the edges. This came down when someone pulled on the edge, or the wind whipped the canopy upward. The underside was completely dry. To prevent my customers from getting a free shower, I just went around the canopy, tugging down on the 4 edged to minimize the puddle effect. 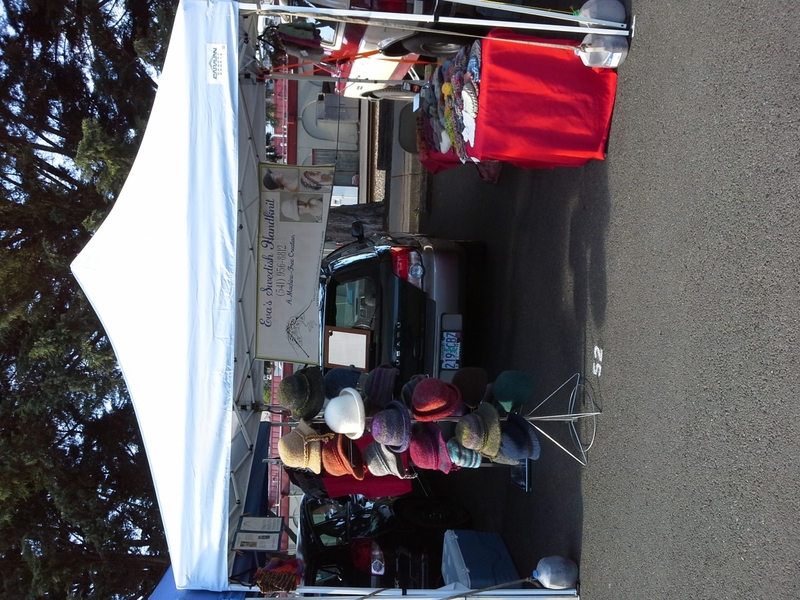 This canopy is extremely easy to set up, lessening the setup time for my sales at a Saturday market! 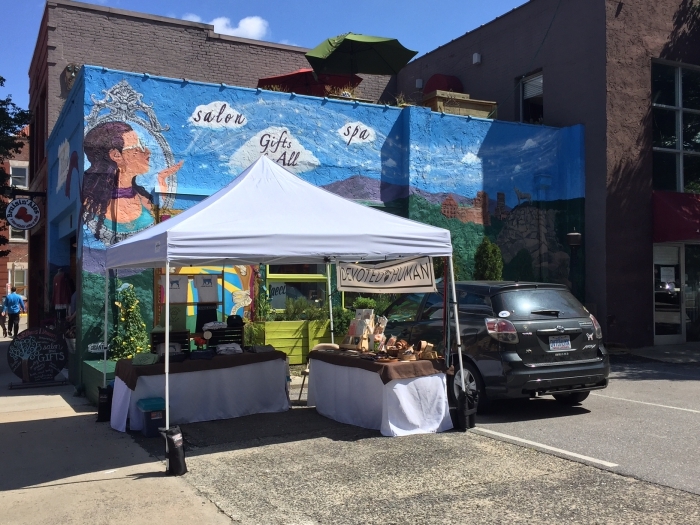 I use this canopy at an outdoor flea market and have been stuck in the rain a few times. The canopy top sheds most water but does collect some. It's never collected so much that I've been afraid of it collapsing but if its raining a lot I do occasionally have to push up on the sides to dump water off. If it has rained then stopped and you're ready to break down the tent you do need to drain the top before attempting to collapse or the weight of the water could structurally damage the frame as you're lowering it. All in all it's a great tent. Hope this answers your question. We use the canopy on jobsites. It is really nice in the middle of summer, and we have not used it in rain. However, the peak stands about 3 1/2 feet above the frame giving the roof alot of slope, so I do not anticapate there will be an issue with run off. I can see there might be a problem if the peak is not extended to its full design height. I have not had that problem. This is the second addition to one I have bought from them a while back. You have to make sure the top is on there tight and not dipping in the center. Pull down on each corner when you erect the tent. If you do this each time to make sure the top is taunt on there, you should not have the problem. I put two tents side by side for my flea market selling and curve the flaps at the connecting side up so it guides the water to the back of the tent. Yes, the Caravan M Series is water resistant. I had it up when it sprinkled and yes no water came thru. The canopy itself is water resistant. However, closing the tent down with the top on created lots of little holes where the fabric was pinched in the frame. Fabric patch for tents works great. The frame itself is not: it needs lubrication at least once a year and will rust if exposed to wet conditions a lot or folded up when wet. The paint will also come off with tape and over time. All said, this is our 3rd Caravan tent and still one of the better ones on the market in terms of ease of use and durability. Does this come with side panels? No, it does not come with side panels and side panels are not available for it. Please view our Canopy Package Deals for the canopies we have available with the side walls included. Is the canopy material water/rain proof? It is water resistant, but not water proof. The only actually water proof canopy we have is the Vitabri canopy. How does this canopy anchor down? All of the Caravan Canopies come with a standard stake kit for you to secure your canopy in case of windy conditions. We also suggest weight bags if you are setting your canopy up in an area that can not staked. ! Does this canopy come with a roller bag? If not, is there a bag available? Yes, this canopy does indeed come with a roller bag. Does this canopy meet the NFPA-701 Fire Resistant Requirements? I'm looking for a 10x10 or 12x12 straight leg canopy that folds down to less than 48" for storage. Do you have anything that folds compactly when stored in a car? What is the height from the ground to the lower edge of the canopy? The height is a 7' clearance. Please let us know if you have any further questions. Is this fire resistant? And is the fabric water resistant? The top is only water resistant. If it rains you will have to knock off the rain so it will not accumulate and start to leak. The M-Series does not have a fire rating but has a layer of fire coating. Does it come with sides or can you purchase sides? It does not come with sides and sides are not available. It arrived as expected. Easy to put up. I wish the zipper on the carry bag went all the way up the side of the bag. The wind tore my old canopy and I needed a replacement. I participate in a local weekly market and the weight was the most important issue for me. After extensive research, I settled for Caravan Canopy M-Series Pro 2, which turned out to be an upgraded version of my old canopy. It only weighs 33 pounds, light weight steel, with water resistant canopy. It is easy to set up ( even for an older lady although I need some help to pull it out). Have used it twice and am very pleased. It looks fresh and professional. ConsWas told this particular model does not offer a replacement canopy. I have had other canopies that cost more. They were harder to erect and had flimsy construction. This one is easy to put up and easy to take down. The carry bag fits well and it is easy to get the frame and canopy in and out of the bag. ..Nice looking and easy to setup. However, you can see through the seams (daylight), which tells me that even a light rain will leak through.. Not good for items inside. Have had two Easy UP canopies for over 10 years. Used every week from April to November. Never had a leak. Granted, they cost more, but making the seams leak-proof should be an easy matter. Time will tell how well this one will hold up. ProsEasy to haul around in its carrying case. Easy to put up; we had two people do it in less than two minutes. I have a higher-end eCanopy craft tent that I use for bigger events, but its 80 lb weight is really tough to lug around. I bought this one so I could set up a tent more easily at smaller events. It's only about 35 lbs so it's much easier to shlep. The canopy is not as strong as the other one and the bag is pretty flimsy, but this tent overall will work just fine for my needs on sunny days with low wind. I've only used it once and the bag is already ripping...but I think these bags are made to self-destruct. I've used my other more expensive tent about 8 times so far and that "sturdier" bag is full of holes and falling apart as well. The bags are junk so don't expect much from them. It's a little challenging for one person to set up, but I'm a 43 year old woman who did it so you probably can too. The push button locks on the legs don't fall in line super smoothly, but with a little patience it sets up just fine. DEFINITELY get weights for it. All of these things can blow away like an umbrella with a gust of wind! 17 of us visit the beach! We put the tent up every day early and are loving it! It is easy to get up and down- just watch the video! ...Very glad I made the purchase! ProsSturdy and provides great shade. There was a good price, quick shipping,it looks great and was easy to put up. I will buy from this seller again. This product is less weight than most, and with the white canopy it was cooler inside. ConsDo not use tabs to anchor top until completely up. Light weight and easy to set up. Good value. ProsLight weight and easy to set up. ProsStraight leg canopies are the best. I purchased this for my daughter for Christmas. Easy to order and prompt delivery. Would buy from eCanopy again. Easy setup. Worked well. Very good for the price! Great canopy at a great price. The shipping was fast and free and packaged very well. The canopy is new and in perfect condition. Durable and light weight, great for working the local markets! If I could give 10 stars I would! The product is just as described, new and in perfect condition. The product was well packaged for shipping, which was fast and free! A great product at a great price! 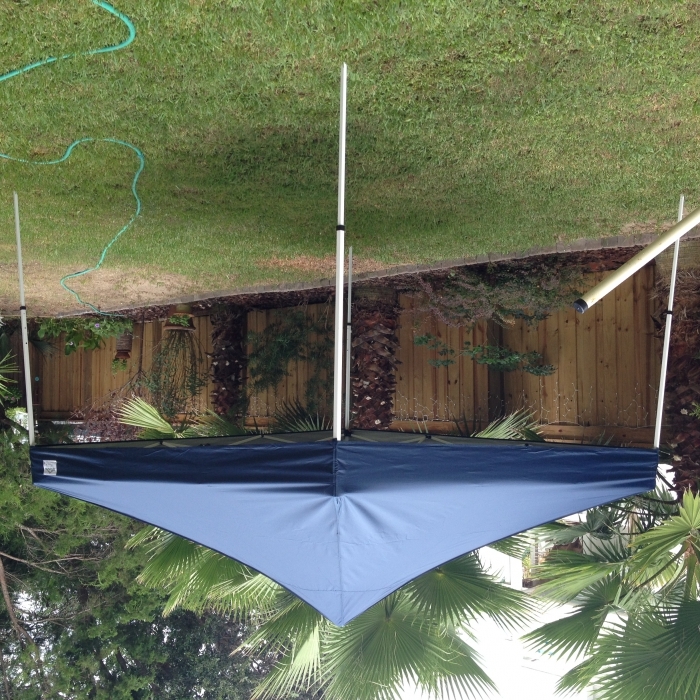 If you're new to setting these canopies up it can be a little bit of a challenge but once you do it, it's a breeze. It was a very good product and the price was fantastic. When we open the outer box and pulled out the actual box for the canopy to our amazement it had wheels on it. We were able to transport very easily. This was raffled off to raise money for a non-profit organization and the winner was extremely happy. Thank You! ConsI wish they would make the bag bigger to fit the canopy once you get the top on. It's hard to get it in the bag. Can't beat the price - when used with care, and carefully following the instructions, this tent should last for many seasons. ProsAn affordable tent for when that's all you need. ConsThis is not the tent for someone who is out on the circuit every weekend. Good for shelter but not for Market canopy. OK for sale price paid but not for what it was intended. Top is very thin and frame construction is light. ProsPrice on sale was good. 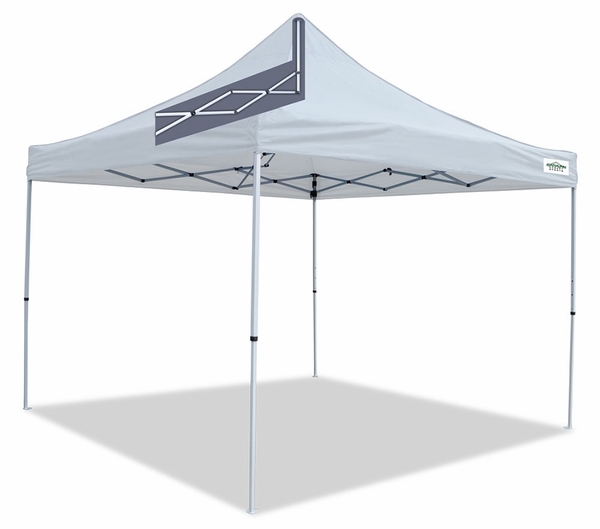 If needed for shelter or party tent, I would recommend the M pro series for that purpose. ConsThe frame is too light and the top is not strong enough to use for Market canopy. 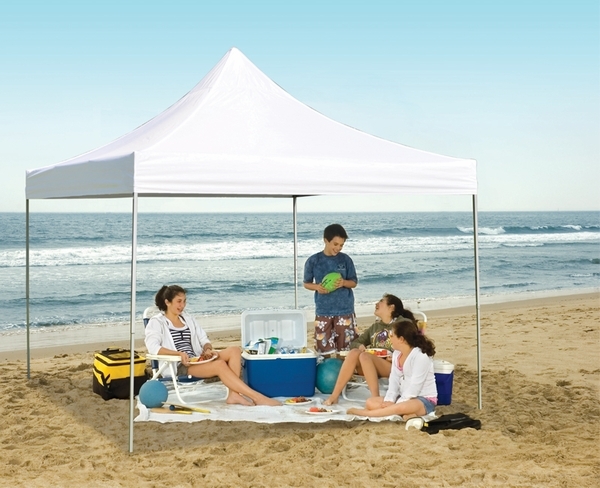 This is a great product, easy to set up and take down, and simpy the best I have ever used as shade at the beach.